Blackened fish is offset by a spicy slaw in this classic combination. In a small sauté pan, lightly toast the mustard seeds over medium heat. In a large bowl, mix together the cabbage, carrot, green pepper, green onion, mango, garlic, mustard, mustard seeds, curry powder, vinegar and olive oil. Season to taste with salt and pepper and set aside. 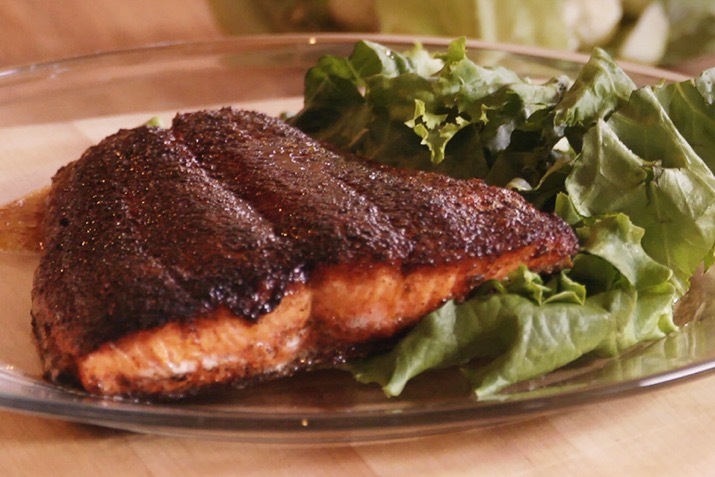 Rub the flesh side of each salmon fillet evenly with blackening spice. Heat a large iron or heavy-bottomed skillet over medium-high heat. Lightly coat the skillet with vegetable oil. Place the salmon, skin side up, in the hot skillet and cook for 4-5 minutes until the seasonings form a crisp crust. Turn the salmon pieces over and cook another 2 minutes until salmon reaches desired doneness. Divide the slaw between four plates and top each with a serving of salmon. Serve this classic combination of slaw and blackened fish with sweetened cornbread and a green salad.